If printing this education material, we suggest you also print the relevant linked pages from the prizes database. For further making activities and suggestions for looking at portraiture, see our portraiture education kit. Have you ever had to work really hard to achieve a goal? This portrait is of cycling champion Anna Meares who did just that when she overcame terrible injuries to win an Olympic medal. Notice how the artist, Phillip Barnes, has used words and phrases that tell us about Anna’s character and the difficulties she has faced. Look into Anna’s eyes. Can you sense her determination and focus as she is about to start a race? Identify all the ways Barnes has communicated Meares’ determination and suggested the qualities required to be an elite sportsperson. What stylistic influences can you identify in this painting? Consider, in particular, graphic design and advertising as well as movements such as pop art. Do you have a pet or favourite animal? Kate Beynon has painted fellow artist Sangeeta Sandrasegar as if she is a Hindu goddess, riding on her pet cat called Fuji. Fuji has been transformed to a tigerlike size and Sangeeta has many arms, each one holding something different. What objects do you recognise? What could Sangeeta use them for? What would you be able to do more easily if you had as many arms as Sangeeta? How does the artist suggest Sangeeta’s profession? Discuss the symbolism of the items Sangeeta is holding. What is the impact of keeping her in contemporary clothing? List the features of this image that reference the goddess Durga. 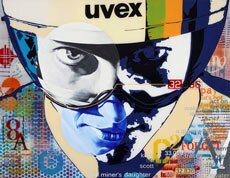 Discuss how Beynon has appropriated elements of popular culture, illustration and advertising and combined these with traditional Hindu imagery in this cross-cultural portrait. Spot this graphic portrait. What parts of the picture do you notice first? Mitch Cairns has painted Reg Richardson in a bold, modern style using lines, blocks of colour and simple shapes. Notice how the illusion of depth and space has been created with just strong lines to indicate the room he sits in. What quirky things do you notice about how Reg is dressed? What do you imagine Reg Richardson to be like? What elements in the portrait contribute to your conclusion? How would you describe the style of this portrait? How has the artist created a strong composition? What is the impact of the bright red colour, the repeated horizontal lines and the single vertical line? Imagine the steps Cairns might have taken to paint this artwork. Have you ever seen your own image distorted in something shiny? The artist, Peter Churcher, was inspired to paint these four self-portraits after seeing someone carrying a bunch of balloons. Peter enjoyed the challenge of distorting and painting his image; showing how the curve and shine of the balloons changed his appearance. Can you notice the details of his art studio also reflected in the balloons? Read about the evolution of this artwork in the accompanying label text in the prizes database. Consider how an artist may start an artwork then find unexpected results. Debate in class whether this is a self-portrait or a still life. How does the inclusion of characters from popular culture impact on your interpretation of this artwork? Discuss the contrast between traditional oil-painting techniques and these pop culture references. Do you have a family member who you love and admire? Anh Do has painted a close-up of his father Tam Do’s face using thickly applied oil paint. Notice how the oil from the paint has seeped around Tam’s face to create a shadow-like shape. His face also appears to come out of the canvas as Anh has used bold colours and strong shadows to create depth. How does this portrait make you feel? Anh Do says his father has a defiant and untameable spirit. How is this reflected in this painting? How has Anh Do suggested the struggles his father has endured? What do you think Tam Do is thinking? Compile a list of words to describe this portrait. Anh Do said he selected the unprimed surface so to ‘bleed a shadow of my father’. How does the oil stain seeping from the portrait contribute to your overall reading of the painting? Do you like to dress up? Can you recognise who this little boy is dressed up as? The artist, Vincent Fantauzzo, has painted himself as if he has taken on the appearance and character of his son Luca. What do you think Vincent admires about his son? If you could be a superhero, what powers would you like to have? Consider how the composition draws us into the child’s world. Why has his head been cropped? What is the impact of his gaze? How does the costume increase our connection? Consider how Fantauzzo uses photography in his practice. Compare this painting to his previous Archibald entries in 2008, 2009, 2011, 2012 and 2013. Is there a particular portrait you connect with? Explain why. Do you play or follow a particular sport? This painting is of Sydney Swans player Adam Goodes. Adam has achieved a lot in his sporting career, including the most AFL games played by an Indigenous player. He was also named Australian of the Year this year for his community work. The artist, Alan Jones, was keen to capture the different sides of Adam’s personality by painting two versions of him within one picture. What characteristics do you think Adam has? Compare the two portraits within this painting. Jones chose an oval shape for the secondary portrait. Do you think the composition would have been as successful if this was a different shape? Research the format known as a tondo. Discuss what the format suggests about this artwork’s relationship to portraiture traditions. Identify the different treatment of areas in the painting. How do the various textures contribute to the overall success of the painting? Find this peaceful portrait. Dapeng Liu has painted Yin Cao, curator of Chinese art at the Art Gallery of NSW, against a traditional Chinese landscape. Spot the magnifying glass she is holding in her hand. What would she use this for? The artist was keen to show his own interests, his Chinese heritage and love of art within this portrait. Can you spot the tall buildings of Sydney’s skyline hidden in the background? Examine how Liu has incorporated both Western and Eastern traditions into this painting. Identify the elements that hold symbolic meaning. What is the significance of the colours he has used? Find out about the 1943 Archibald Prize controversy surrounding William Dobell’s painting of Josuha Smith. Compare that portrait to Liu’s. How has the figure of Yin Cao been stylised? Discuss what makes a painting a portrait rather than a caricature. Do you have a place you like to visit that is special to you? Fiona Lowry decided to paint the architect Penelope Seidler looking up at her home in the Sydney suburb of Killara. Penelope designed the house with her husband, fellow architect Harry Seidler, and you can see in her face how much she admires their home and all of the memories it holds. How does the lack of colour in this delicate portrait add to the mood and atmosphere? What is your initial response to this portrait? Observe the painting from different distances and vantage points and describe what you see from each. Discuss how the technique of airbrushing challenges traditional portrait-painting practices. What do you think Lowry is intending to portray about Seidler in this portrait? How would you describe the painting’s overall mood? What significance does the idea of memory have in this portrait? This double portrait is of the famous Australian actor Cate Blanchett. Cate has appeared in many movies and the artist, Tim Maguire, has used movie-making language in the painting’s title to give us a clue about her career. Look closely at the colours used in Cate, take 2 . Can you see the primary colours, red, blue and yellow, and how they are blended to make new colours? Which one of them is missing in Cate, take 1? Which panel do you like best? The title of this work makes reference to filmmaking yet Maguire has portrayed Blanchett in a natural manner without the associated movie-star glamour. Discuss whether this artwork reflects the public or private worlds of the sitter. Read about Maguire’s painting technique in the accompanying label text in the prizes database. Create a portrait in which you experiment with a similar combination of random and structured approaches, documenting each stage of the process. Do you like to daydream? Julian Meagher has painted a portrait of actor John Waters looking off into the distance, as if he is daydreaming or thinking deeply about something. What could he be thinking about? Julian has used thinned oil paints to create a watery, dreamy effect which enhances the mood of this painting. Would it look as effective if the paint was thicker and the canvas larger? Consider the pose of the sitter in this portrait. What does his body language indicate to you? Compare this work to others in this year’s Archibald. Discuss the difference between a direct and indirect gaze and how this impacts on you as a viewer. Meagher has applied thin layers of oil colour over a pencil drawing to build up form. Study how he has captured light falling on the contours of Waters’ face. Experiment yourself with thinned oil paint or watercolour to build up layers of colour and form on a face. Do you ever remember your dreams? This painting is of Professor Kate Leslie, a doctor who asks patients if they had any dreams while they were under general anaesthetic. Anaesthetic is a special type of medicine that is used to put people to sleep so they don’t feel any pain during surgery. Look around the picture. Can you spot clues that tell us about Kate and her research? Mezei has used a technique known as chiaroscuro. Research chiaroscuro and its use in paintings over the years. Compare Mezei’s work to a baroque painting. What is the impact of applying this technique? How has Mezei created a narrative in this painting? List the symbols that help frame the story. Why do you think the flowers are depicted as less than perfect? Do you think Mezei has successfully suggested the sitter’s career through the use of these devices? What activities do you love to do that help you lose yourself in the moment? Mia Oatley really enjoyed painting fellow artist Tim Maguire and you can sense this in her loose style and bold brush marks. Do you think she painted this quickly or slowly? Mia has used simple lines, pattern shapes and strong colours to create this large portrait. Imagine you are painting this portrait and move your body in the rhythm and patterns you can see. Compare this work to the other finalists in the exhibition and identify the qualities that make it unique. Oatley describes herself as a colourist. Find out what this means. Discuss what you think this term suggests about her artistic practice. Do you think Oatley has achieved the challenge she set herself to create a portrait that was ‘colourful, free and natural’? Explore the relationship between the artist’s style and the physical likeness of the subject and the impression you get of him. Do you think this painting communicates more about Oatley the artist or Maguire the subject? Do you have a sporting hero? Nicolee Payne met Fuifui Moimoi at a fan day for the Parramatta Eels Rugby League Club. She decided to paint him for the Archibald Prize as she found his personality to be warm and gentle compared to his fearsome reputation as powerful front-row forward. Notice how detailed and realistically painted this portrait is. What characteristics do you think Nicolee has captured in Fuifui’s face? Who would you choose to paint for the Archibald Prize? How does Payne suggest the physical strength and character of the sitter, who uses his body to earn a living? How has she highlighted Moimoi’s individuality? Would you read this portrait differently if Moimoi’s torso was clothed? ‘What I saw in him that day was a kind, humble and gentle man: quite the opposite to the tough front-row forward on the football field. I wanted to try and capture those two contrasting persona in the one expression.’ Do you think Payne was successful in achieving her objective? Discuss in class.